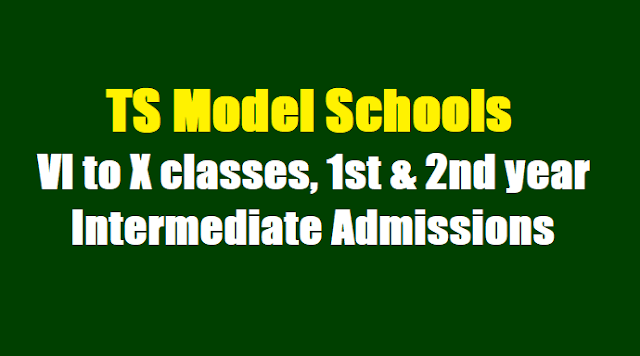 Sub: Telangana Model Schools/ Jr. Colleges - Filling of left over vacancies in VI to X classes and 1st and 2nd year Intermediate - Orders issued - Reg. It is brought to the notice of the undersigned that, there are certain unfilled seats in VI to X Classes and more vacancies in 1st and 2nd year Intermediate in all groups in certain Model Schools. All the Principals of Model Schools in Telangana State are hereby instructed to give press note on 18.08.2017 duly furnishing the vacancy position in each class and also 1st and 2nd year Intermediate group wise and calling for offline applications and to fill the seats on or before 23.08;2017 duly following the roster and furnish the report to the undersigned on 24.08.2017. The above instructions should be followed without fail and disciplinary action will be initiated against the Principal who fail to submit the report.